Since I got terribly into watching a TV Show I was watching I never got around to a regular Weekend Movie Marathon. Now that I finished with that TV Show boxset I thought I would see how many movies I can fit in today. The next step was figuring out what type of mini-marathon to do. First thought was a "Day in History" type subject...but found nothing that happened on this date that interested me for a marathon. That is when Celebrity Birthdays popped in my mind. Seeing there was a few I could watch something for I decided on that. That is 5 stars in my collection that is having a birthday today. My goal for today is to watch 1 movie for each of the 5. The question is only will I be able to actually do it? Holmes and Watson investigate a series of bizarre and apparently unconnected murders, and the death of a possible suspect. The trail leads to a society of hypnotists and a mysterious, glamorous woman. The fiendish Dr Moriarty, though reported hanged in Montevideo, is believed to be involved. This is one of the movies I got in a free 20 disc/40 movie boxset I got when I subscribed to Total Movie Magazine. 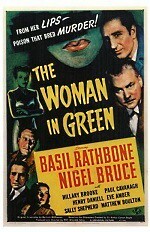 Whenever I think of Sherlock Holmes it is Basil Rathbone that I think of. Though this is one title of many that I never seen before today. It is a good old movie. I enjoyed it quite a bit. I especially liked the ending of this movie. And as usual.... Professor Watson is good for a laugh or two. Bloodcurdling action and spine-chilling thrills put the bite into this howling sci-fi shocker starring Ally Sheedy (High Art, The Breakfast Club) and Lance Henriksen (Scream 3, Aliens). When an ambitious news journalist (Sheedy) breaks into a genetic research facility, she uncovers the biggest story of her career and unleashes the lab's most dangerous experiment: Max - a genetically enhanced guard dog with a vicious killer instinct. Superior sight, hearing, strength, and intelligence make him faster, stronger, and smarter than almost any other animal alive - and deadlier. Without the neuropathic drugs needed to curb his aggressive nature, his predatory urge runs out of control... and once he tastes blood, nothing can stop him. 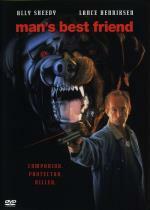 I know a lot of people that thinks this movie is no more then a bad Cujo rip-off. But this is another movie that I always enjoyed. I liked that they made the dog very intelligent. I especially enjoyed towards the beginning where he not only chases after the mugger that takes Ally Sheedy's purse... but he even returns with the purse. I will admit that the chameleon effect was a bit much that basically just looked silly. With the way this movie ended I always hoped for a sequel but it never happened. The first time I saw this I didn't even know who Lance Henriksen was... but I am now a big fan of his. I would have liked to see a few more extras on this DVD also. Jimmy... You can just replace the old review with the one above... it is much more detailed! Today is one of my brother's birthdays. My other brother's birthday was exactly one week ago. Brace yourself for even more super-powered thrills and spectacular DVD action with The Power Cosmic Edition of Fantastic Four: Rise of the Silver Surfer! This explosive 2-disc set is packed with fantastic features. Slip behind the wheel of the futuristic and high-flying Fantasticar in an interactive experience. In-depth documentaries take you inside the secret world of the Silver Surfer--from his comic book origins to his CGI transformation. Sneak a peek at exclusive deleted and extended scenes you couldn't see in theaters! Flame on! I wanted to watch this one... as I have seen the first Fantastic Four movie several times... but only ever watched this one once when I first got the DVD. It has been so long in fact that I forgot most of the movie. While I think I liked the first one a bit more... this one is still a good movie that I enjoyed a lot. One that is just fun to sit back and watch.... without having to think about too much. I thought the Silver Surfer was done very cool. Jessica Alba looked amazing as always. Not sure how I felt about the changing of powers thing. I think it was fun for the most part... but didn't really care too much when Johnny had all 4 of their powers. A Happy Birthday to him! Buzz Lightyear, the ultimate hero from the smash hit Toy Story movies, is back as you've never seen him before! Now for the first time ever, be there as the world's bravest Space Ranger takes on the evil Emeperor Zurg in an intergalactic struggle of epic proportions - right in their onw backyard: the Gamma Quadrant far, far away. This all-new feature-length animated saga includes a special introduction starring Woody, Jessie and Rex. Join them as they cheer for Buzz Lightyear (voiced by Tim Allen): hero, legend, movie star...and an action figure's action figure. Zurg and his henchmen have just invaded the Planet of the Little Green Men in their diabolical quest to take control of the universe. Buzz and his fearless team of Space Rangers Cadets (the mystical Mira Nova, the brave but bumbling Booster and the experimental robot XR) are the only ones who can save the day...and the galaxy! Will Buzz save the Little Green Men in time? Will he defeat the evil Emperor Zurg? Set your course for out-of-this-world excitement as everyone's favorite Space Ranger, Buzz Lightyear Of Star Command, takes adventure and heroism...to infinity and beyond! This one was the choice of my daughter Brittany. While entertaining... this is in no way in the league of Toy Story. It is good enough to hold my attention through-out... but over-all it is just average. I did get a bit of a kick out of the little green men. 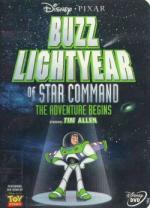 I loved Buzz Lightyear of Star Command when it was first released, but I watched it recently and it looked so dated (animation wise) and I just did not enjoy it. I am just glad I was able to fit all 5 in... as I am working on a movie with Malcolm McDowell this afternoon. Not bad... I usually do about 6 for a weekend. And today I am doing 5 in the one day! In 1984, Stephen King's Firestarter became a horror film hit, with its frightening tale of a young couple whose involvement in a secret government drug experiment produced a dangerously gifted child. Sociopathic agent John Rainbird was instrumental in the "'Lot 6" testing and earned the young girl's trust for his own ends. He then murdered her parents. Enraged, she unleashed her pyrokinetic powers, engulfing Railbird in flames – and left him for dead. The child is now a woman. Charlene "Charlie'' McGee (Marguerite Moreau) has spent the past 10 years on the run from the unscrupulous government agents who created her. Now she's through running and has decided to reclaim her life. A showdown is inevitable, and Charlie's only chance for survival lies in a turncoat government agent and a half-mad professor named Richardson (Dennis Hopper). This is actually a TV Miniseries that originally aired on the Sci-Fi Channel (I must say I still hate the new name of Sy-Fy!). I am sure it would have been a nightmare to pull off... especially for the Sci-Fi Channel... but I always thought it would have been cool to have Drew Barrymore reprise her role as Charlie in this miniseries. It is a good miniseries... though I do prefer the original movie. Even if it never was one of my favorites. I did like Malcolm McDowell in this one. And Marguerite Moreau does a fine job as well. She is an actress I am not really familiar with... but I enjoyed watching her in this. Woohoo! I made it! 5 movies for a 1 Day Marathon! Not bad!